I know I have shared a vanilla scone recipe before, but this is a new and improved (or at least easier) recipe. This past Saturday, a friend and I co-catered a breakfast for over 100 people. Our menu was very simple, but very delicious. We had fruit, yogurt, granola, and three types of scones. 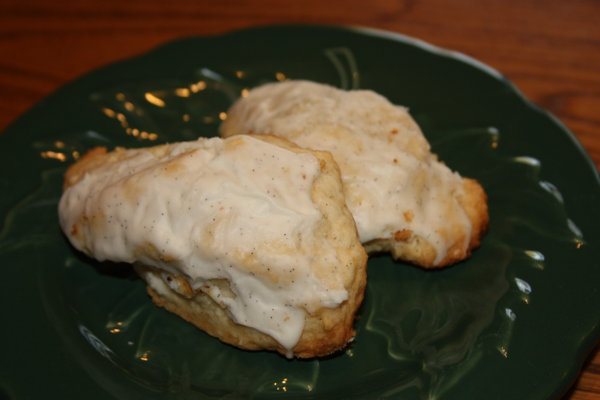 When we were first discussing our menu, we knew we wanted to make a variety of scones and vanilla was on the list. In an effort to simplify things, I tried a new recipe so that all of the scones we made for the event would share a common base and so that I wouldn’t have to keep a wholly different set of ingredients. Earlier in the week I attempted to make the scone and felt it was a success. So on Friday, Karla and I set out to make 13 batches of scones. All used the same base recipe, but we tweaked each of them to have their own unique flavors (vanilla, cinnamon, and strawberries and cream). 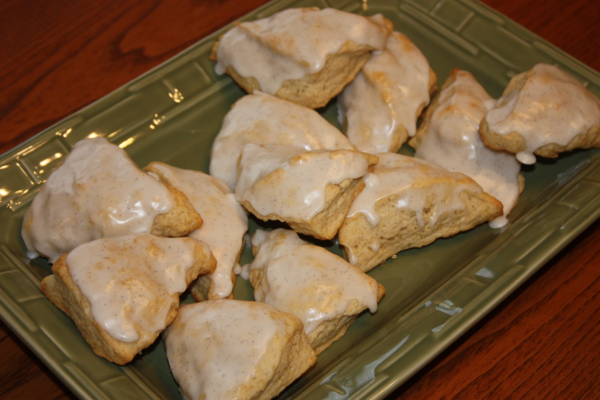 I loved this new recipe for the vanilla scone and I knew that I needed to share it with you. These are great for making in advance and then freezing until you are ready to bake them. When you are ready to bake, just stick the frozen scones on your baking sheet, brush with melted butter and bake. You may need to increase the baking time by a few minutes, but it is a great way to have fresh warm scones throughout the week. Why not make a big batch and then bake them as you need them? Shape the dough into approximately an 8 X 4 inch rectangle on a surface sprinkled with flour. Cut the rectangle into 8 equal pieces. (I cut my dough in half and then each half in half then down the center lenghtwise so that I have 2 rows of 4.) Once I have 8 pieces I then cut them diagonally. Separate the pieces and space them out on the baking sheet. Brush the tops of the scones with melted butter. Bake for 15-20 minutes. Let them rest on the baking sheet for about 5 minutes while you prepare the glaze. For the glaze combine the remaining vanilla bean paste from the inside of the bean, any leftover butter from brushing the scones, milk, and powdered sugar whisking together until well combined. Add additional milk as necessary. Gently dip the top of each scone in the glaze or use an offset spatula to glaze the tops of each scone. Let set for a few minutes and enjoy.